is about, but I'm not sure. ... I searched for (and failed to find) support for a 46-year-old memory. The memory is of a retired British merchant marine petty officer who, with an also retired shipmate, took up amateur archeology as a way to escape the houses where their Italian wives did not want them underfoot. After their intriguing discovery made it into some Italian newspaper of the day, I persuaded Newsweek for which I worked in Rome to let me check the story out. The Brits claimed to have found tunnels in beachside ruins about halfway between Pozzuoli and Baia, which, to them, indicated the presence of a cult — Orphic, they contended — that involved convincing initiates that they were being taken underground to the Styx and across it into the Elysian fields. The physical evidence was one narrow tunnel in which remained hinges on which wall panels could have hung to swing out to menace the pilgrims — presumably high on hallucinogens and prolonged fasting and purging — as they were taken where I was to a very small pond (a leak from Lake Lucrinus?) on the far side of which a second, unexplored tunnel lead away to the mysteries. 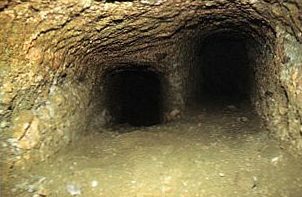 Supporting evidence was a parallel tunnel with small openings into the first through which shrieks and moans could have been broadcast to terrify the susceptible. Outside the tunnels, these imaginative sailors decided, were chambers — including sleeping rooms and baths — where initiates could be prepared over a period of days to enter a trancelike state necessary for the rite to be convincing. The Sovrintendenza of the day (spring, 1965, I think) was not amused, but also didn't have guards to keep these rotund, amiable gents from poking around. The circumstantial evidence they grabbed onto consisted of the fact that Virgil set Aeneas' visit to the underworld on the shores of Lake Avernus, that the description of the coast also fitted nicely with the Odyssey's account of Ulysses' tour of Hades (en route between Circe (Ischia) and the Sirens and that St. Paul, arriving in Puteoli, "... found brethren and were desired to tarry..." presumably Christians who had switched from the worship of Orpheus. Se non è vero.... Maybe Homer's river Oceanus had dried up over the centuries, and I could find no classicist who thought that Orphic cults were active as late as the Augustan era, when, it is true, devotees of Mithras abounded. But I don't think the story ever made it into Newsweek, and now that I'm planning a much delayed visit to Naples, I wondered if you had ever heard such a tale. "Oracle of the Dead" in Baia. Your link provided to Mr. Friendly should give him a good overview of the fabled tourist destination where great descriptions of being carried piggy back through flooded underground passageways by tour guides abound in the literature. An even wilder tale about the "real" lost entrance to the underground river Styx and antrum of the "Oracle of the Dead" AKA Sibyl, or a similar Oracle de jour, came to our Napoliunderground.org site [NUG] some two years ago. A reader named Hans sent us a fascinating letter asking about a book, Oracles of the Dead by Robert Temple, 2002-2005. It is available through many online booksellers. It is not a serious scholarly book, rather it is highly speculative and plays loose and wild with historic references. It contains photos and diagrams of a thermal bath area at Baia . . .Temple refers to it, as though it were archaeological fact, as the lost entrance to the "Oracle of the Dead." It is wild interpretation at best, and ignorant nonsense for the most part. This would be yet a third, perhaps the REAL, Sibyl at the end of a real fear and faith-inducing trip through passageways, across an underground "river Styx" and more before getting to the Super-Oracle who presumably would have spent most of her time going through this torturous daily commute to work to then sit in a sulfurous, steamy chamber waiting to issue her utterances. Temple and his wife and an American officer and his son from the NATO base in Bagnoli did the exploring in parts of the Baia passageway. The American officer who is a scuba diver, and Temple seem to have gotten into one of the thermal supply and steam relief vent systems, which honeycomb the Roman bath areas of Baia. Their total ignorance of what they were seeing was replaced with theories and ideas already in mind from convenient interpretation of historic references. This seems to have allowed them to create a fanciful, almost comic, explanation of what they believed to be the "Oracle of the Dead" passageway that crosses the River Styx into a Greek "pseudo-hell" . . . and on and on. Our speleological researchers, who are very familiar with the Baia archaeological site, visited the so-called "entrance" which is described and shown in photos in Temple's book. It is in a well studied Roman bath area. During the visit to the site they talked with guides on the site and learned that the archaeological park office for the Baia area still remembers having to run off Temple and his "explorers" and prohibited their plans to drag electrical cables and equipment up into the thermal bath vent and supply system which they describe in their diagrams as "the great antrum of the Oracle of the Dead." The Nug website has an exchange of information in English. There are comment exchanges and photos and diagrams from Temple's book which I scanned and included in the Forum exchange. Please forward this to Mr. Friendly for his perusal and entertainment. Thank you very much for sending me, through Mr. Matthews, your page on Robert Temple's expropriation of the work of Robert F. Paget and Keith Jones. They are obviously the two men I met in 1965 and whom I remember as retired British merchant marine petty officers, although one of the links [I found] identifies them as Americans. Paget, I found, did publish his book in 1967 — In the Footsteps of Orpheus and apparently a couple of other travel-guide books on Central Italy. ...I am grateful to you both for steering me to Temple and Paget and for the work you are doing on the Underground Naples site.